Lucky for all of you, a great coconut oil company, Kelapo Coconut Oil, has offered to host a giveaway for one of my lucky readers (as well as a 20% discount for the rest of you, read below). Please visit them on Facebook and Twitter and tell them I sent you! Not only do they have extra virgin coconut oils, but they are all 100% organic too! Please continue reading to learn how you can win some coconut oil! Like I told you, my garden is going crazy. I pulled out my first spaghetti squash recently, weighing in at SEVEN POUNDS! 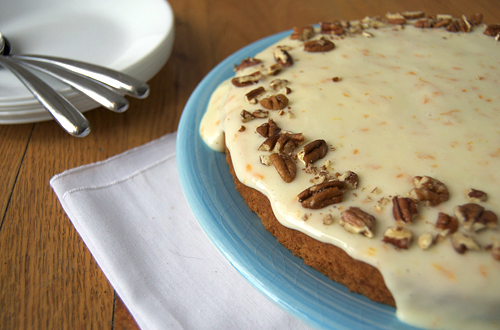 They only reasonable thing I could think to do was use it for dinner AND dessert, so it wouldn’t go bad… 😉 This cake is amazing; it is a lot like carrot cake, but I think I like it more! It has that sweet flavor and dense texture, plus is filled with nutritious squash! It is super easy to make. You can use butter instead of coconut oil if you can’t get ahold of coconut oil, but I suggest using the coconut oil. It gives a nice hint of coconut, plus has so many health benefits! This dessert is great for a Thanksgiving dinner with all the winter squash coming in. Preheat the oven to 350F and grease a 11" round baking dish. In a medium bowl, combine the sugars, coconut oil, nutmeg and cinnamon. Beat with an electric mixer at medium speed until evenly combined. Add the milk, egg and vanilla; then beat at low-speed until evenly blended. In a large bowl, combine the flower, baking powder and salt, stirring to combine. Add the sugar mixture and squash and beat until well combined. Pour the batter into your cake pan and cook at 350F until golden and cooked through (about 30-35 minutes). For the cream cheese glaze, combine the cream cheese, orange zest, powdered sugar and milk in a small bowl and whisk until a thick glaze is formed. Let the cake cool completely, then remove from the pan and pour the glaze over the top. Garnish with the crushed pecans before serving. Ok so here is how this giveaway is going to work. I am going to give you multiple ways to enter throughout the week. After the week is over, I will pick a random winner who will receive their own 15 oz jar of organic Kelapo Coconut Oil! So how can you gain entries? Tell me what you would make with your coconut oil or what you would like to replace with coconut oil. Tweet about this giveaway (use @jennymo57 in the tweet). I will pick a winner on Tuesday, October 4th. Good luck! Hi! This sounds delicious! Looking forward to trying it. Just so you know, I follow Kelapo on FB, Follow you now, think I’m either mushymom or Lisa Rogers (I don’t remember, lol) now follow you on StumbleUpon. Yum! The cake looks delicious. I don’t think I’ve ever cooked with coconut oil before. Would be interested to give that a try. Plus each body is different. What might be healthy for you, may cause an allergic reaction in me for example. I actually found you by stumbling. I (ashamedly) have yet to try coconut oil, but I have been reading a TON of baking recipes (mostly cakes and muffins) that use it. I would definitely have to give one of those recipes (or maybe yours!) a try! 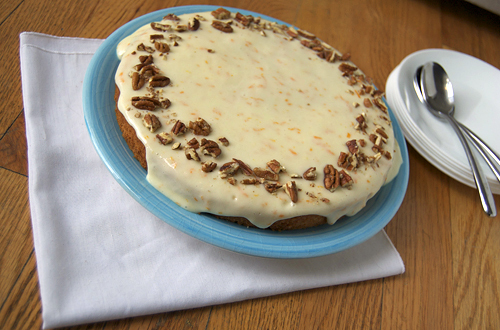 I would probably make this squash cake because it looks SO GOOD!!! As far as substitute – I do use more butter in my sauteing than I should and this looks like a good substitute. That looks so yummy! I would love to make some pumpkin streusel pancakes with the coconut oil. Commented on the brussels sprout pizza post. I would def replace any vegetable/canola oil with coconut oil! This cake looks fantastic! Definitely want to give it a go soon! I haven’t tried coconut oil yet, but I have been reading about it lately and I think I would like to use it in sweet breads or cookies in place of butter! I have not tried cooking with coconut oil yet but if I win I would love to try it in a savory chicken dish I had recently seen blogged about or in baked goods. This is a generous giveaway. Your cake sounds so delicious and looks amazing. LIKED your Facebook page under the name Rochelle Bishop. I would make coconut cupcakes!! I’ve been dying to try them! Most likely, I would start with chocolate chip cookies – a classic and something that I’m totally comfortable with so I can see how it works! Thanks for the giveaway and how cool are you to make cake with spaghetti squash? I never baked with coconut oil .. get to worried that it might make it hard and not really moist! Should definitely try sometime. I’d love to make coconut brownies! I keep hearing about this coconut oil. I need to try it!! Your spaghetti squash cake sounds so interesting. I love spaghetti squash but never thought to make it like this. I would try it in chocolate chip cookies. It’s supposed to make them healthier, but also give the flavor a little something special. I follow you on Twitter as avroradavidovna. I like you on facebook as Avrora Davidovna. I follow you on StumbleUpon. I stumbled your giveaway at StumbleUpon. I commented on your Mediterranean Spaghetti Squash recipe post. I finally tried spaghetti squash for the first time this week. Now, I’m am interested in trying different ways to prepare it. I never even thought about making it into a cake. Great idea!